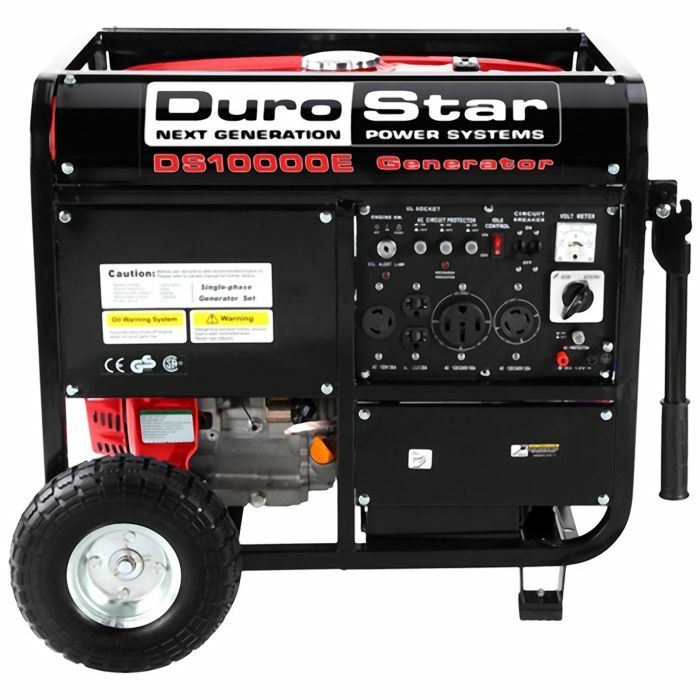 The DuroStar DS10000E 10,000 Watt Generator is the most powerful Generator currently from DuroStar. to a Weekend with the RV. Spark Arrestor, Your unit will remain safe and in top operating condition. simply use the 1-pull recoil cord to start the generator. This unit was designed to allow anyone to start and operate. All models are available with Electric and Recoil Start. Our Friendly Technicians know these units inside and out. and they will be glad to help you out. to the load and then lowers it again when the load is removed. Selector switch always be in the 120V position unless 240V is required. main control center for the Generator. Shutoff Switch, Volt Meter, and Circuit Breakers. Electric Start, that's as simple as starting your car. make it easy to transport over every terrain.